Sebastian Vettel says there is still a "big gap" between his Ferrari team and rivals Mercedes. Ferrari have pushed Mercedes hard at each of the last three races, including a victory for Vettel in Malaysia. Vettel, 27, said: "Not so long ago, three months, we were here for winter testing and the gap between everyone and Mercedes was huge. "What has happened since then for us is very positive but the gap is still there and it is still big." Vettel is third in the championship, one point adrift of Mercedes' Nico Rosberg and 28 points behind world champion Lewis Hamilton, who has won three of the four races and finished second behind Vettel in Malaysia. Mercedes also lead the constructors' championship with Ferrari in second place. Vettel said he hoped a series of aerodynamic upgrades on the Ferrari for the Spanish Grand Prix this weekend would reduce the gap still further. "Barcelona historically has always been a place where teams have brought updates to its cars, sometimes bigger or smaller," Vettel said. "We've probably done the same as everyone else but hopefully we'll have a bigger update and a better lap time to catch up to the guys in front, Mercedes." Hamilton said he was hoping for another strong performance on a track where he has only won once before. The 30-year-old said he felt he was driving at least as well as ever. "I feel very happy with how it's gone," Hamilton said. "I left the last race thinking it has been a great couple of weeks. When you have a year like last year, to continue with it is not easy. "So far I think it has been better than last year. But we are by no means in the clear. We have a long way to go and others are working very hard to close that gap so I have to really stay on my toes and continue to be innovative with the things I do on the track and work with the team to extract as much as possible." Hamilton has had a busy schedule since the last race, fitting in two separate trips to the United States alongside commitments for Mercedes in Europe. He added: "I am probably the happiest I have been in a long, long time career-wise, and then outside it's great when you can do things that you want to do that aren't distractions and then you can perform and no-one says anything about it. "I make my own decisions and I'm very careful with the things I choose to do that they don't come in the way of ultimately preparing for racing and becoming world champion, which is my primary goal. In the car, [at] my age, I feel the best I have ever done." 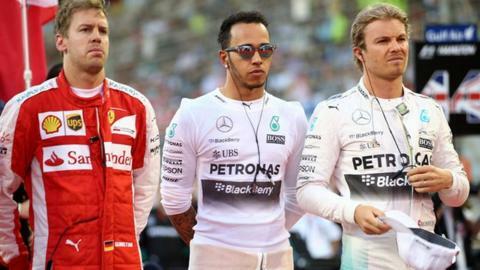 Rosberg has failed to beat Hamilton in either qualifying or race all year, but said he was confident he could yet get the better of his team-mate. "It's just a matter of maximising the weekends," Rosberg said. "It's not really come together until now. I just need to put it all together and of course I'll start to try to do it from here onwards."